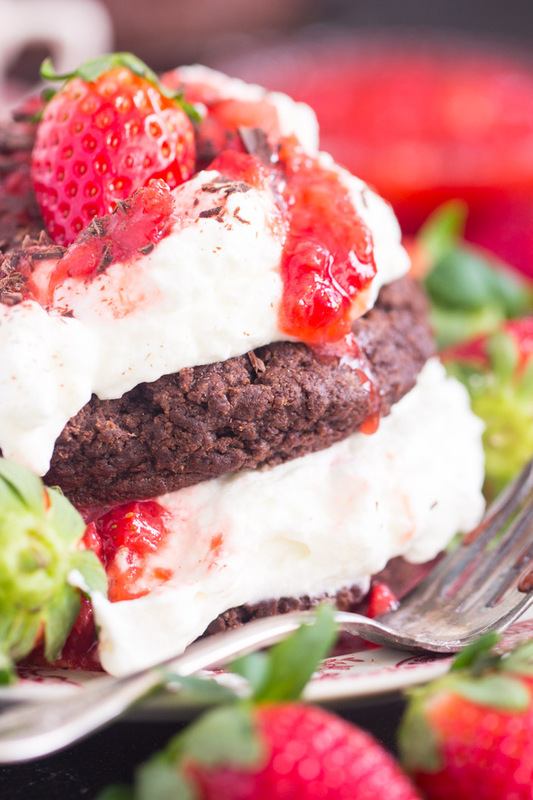 Tender, flaky chocolate shortcakes, heaped tall with fresh homemade whipped cream, and a simple, easy homemade strawberry sauce. 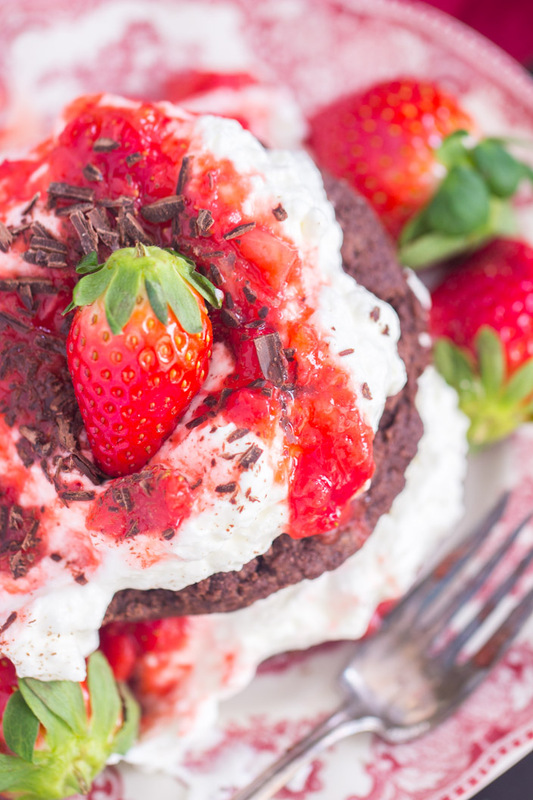 This Chocolate Strawberry Shortcake Recipe is a chocolate lovers’ take on a classic! Your Valentine will certainly thank you! I made this Chocolate Strawberry Shortcake recipe for Valentine’s Day last year, and I’m just sharing it now. I’m already late to the party this year! January is quite quiet for a dessert blogger. No one is thinking about cheesecakes or pies in January, so I’ve started a new thing the last few years: I use January to recharge and to get organized. I don’t see the point in spending too much time whipping up cookies when NO ONE really wants to touch desserts after the holidays. Except me? So I don’t. I take the time off, and I set myself up for a more productive year altogether. For the last 6 weeks or so, I’ve been spring cleaning like a mad woman. Every nook, cranny, and corner of my house, top to bottom, was cleaned, reorganized, and in some cases, redecorated. It was a massive undertaking. But it feels sooooo good. I aimed to complete all of my house projects by the end of January, but it bled into February a little bit, and now I’m ready to get back to focusing on new recipes for 2019! 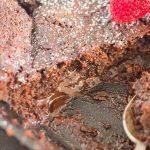 In the meantime, I’ll share all the Valentine’s Day recipes that I should’ve shared well before Valentine’s Day. Oh well, here we are. These are also great for springtime in general, so there you go. 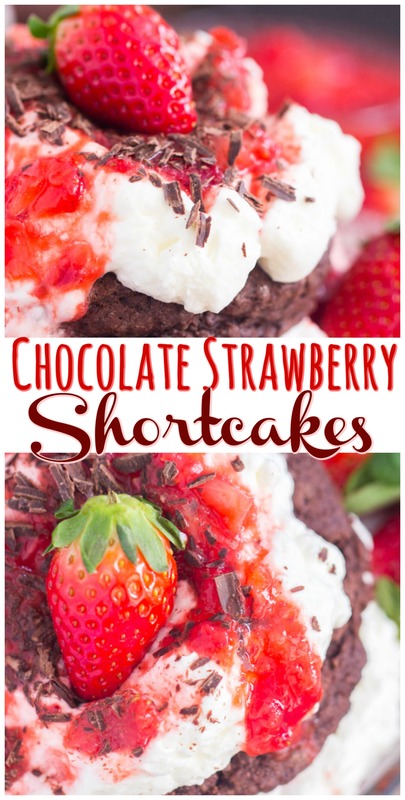 This Chocolate Strawberry Shortcake Recipe…. it’s just a small twist on a classic recipe, but how much more decadent is chocolate than vanilla shortcakes? Much more decadent! And the chocolate version feels much more romantic, doesn’t it? 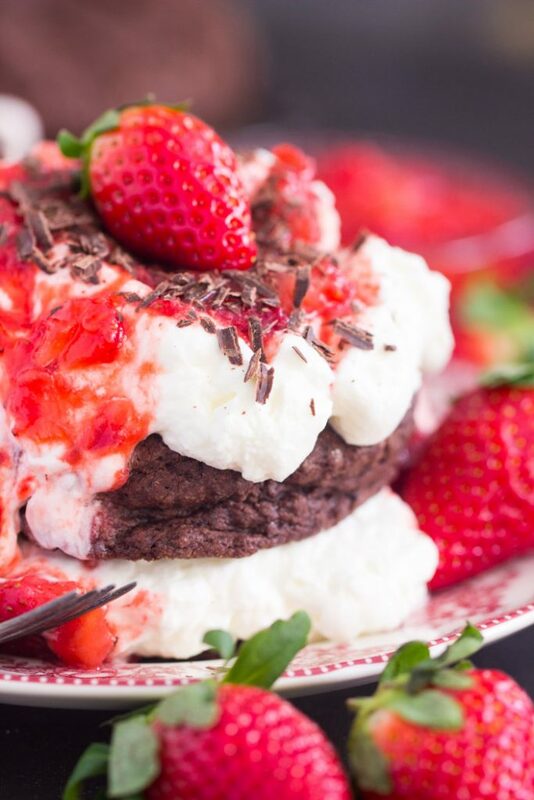 I think this Chocolate Strawberry Shortcake Recipe is such a special dessert to share with loved ones for Valentine’s Day. The biscuits are a breeze. Easy to throw them together, and they bake up a little flatter than a standard shortcake, probably due to cocoa powder, but they are still tender, flaky, and rich. Homemade whipped cream is a must with this Chocolate Strawberry Shortcake Recipe. 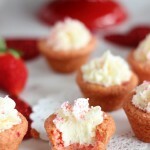 There’s only a few simple components to strawberry shortcake as it is, and I feel that each one should be top-notch. I personally really like Cool Whip too, so you could definitely take that shortcut, but this recipe calls for homemade whipped cream because there are certain instances where you need the real thing. 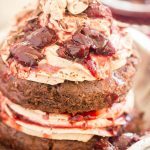 Lastly, the chocolate shortcakes and homemade whipped cream are stacked and smothered with a simple homemade fresh strawberry sauce. Loads of ripe berries, a bit of sugar, and a touch of balsamic vinegar. If you’ve never tried balsamic vinegar with berries, you are missing out on a whole new world of amazingness. Don’t leave it out of the recipe, and thank me later! 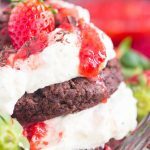 Tender, flaky chocolate shortcakes, heaped tall with fresh homemade whipped cream, and a simple, easy homemade strawberry sauce. 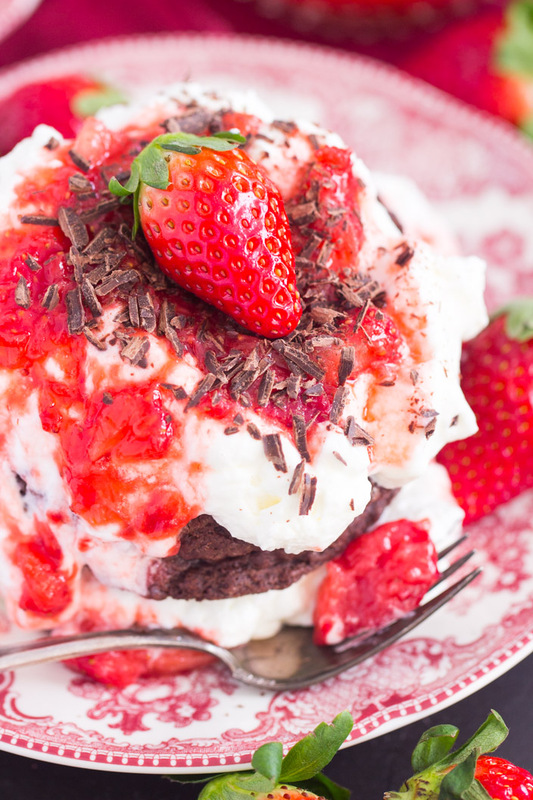 This Chocolate Strawberry Shortcake Recipe is a chocolate lovers' take on a classic! Your Valentine will certainly thank you! 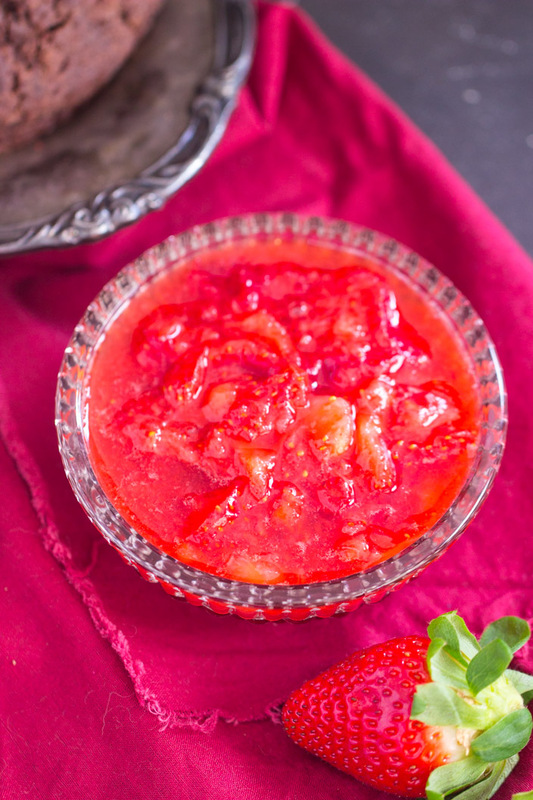 In a medium bowl, combine strawberries, 1/3 cup granulated sugar, and balsamic vinegar. Using a potato masher or fork, lightly crush the strawberries until some are still mostly intact, and about half are smooshed. Set aside to macerate, about 20 minutes. 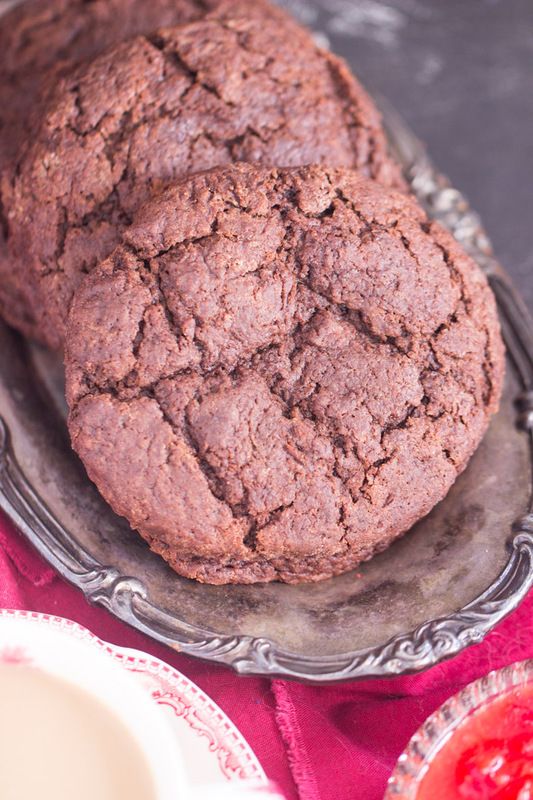 In a large bowl, whisk together flour, cocoa powder, 3/4 cup sugar, baking powder, and salt. Using a cheese grater, grate the butter into the flour mixture, and stir to distribute. In a small bowl, whisk together heavy cream, vanilla, and egg. Add the heavy cream mixture to the flour mixture, and stir with a wooden spoon until mixture just comes together - do not overmix! Turn dough out onto a lightly floured surface, and knead about five times. Pat dough into disk about 3/4-inch thick. Using a 3-inch cookie cutter or biscuit cutter, cut as many rounds as possible. Arrange two inches apart on a parchment paper or silicone mat-lined baking sheet. Reform scraps of dough, and cut out as many rounds as possible. Arrange on baking sheet. Bake at 425 degrees for 12-15 minutes, or until shortcakes appear set. Remove shortcakes to a wire rack to cool completely. In a large mixing bowl fitted with a whisk attachment, beat heavy cream, vanilla, and 3 tbsp. sugar just until stiff peaks form. Cut each shortcake in half horizontally. Place bottom halves on a serving plate. 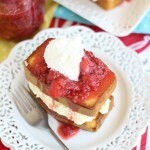 Spoon about 1/4 cup whipped cream onto it, and cover with several tablespoons of strawberry sauce. 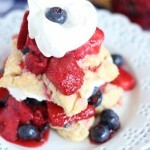 Set the top of the shortcake over the strawberries, and add additional whipped cream and strawberry sauce. Serve immediately!